North Carolina has several different types of rock and soil that can produce acid when exposed to air and water. While releases of acid are easily controlled, acidic water can be harmful to plants and animals if left unchecked. Also, these rock types may be more susceptible to landslides. The North Carolina Department of Transportation pays close attention to road construction in areas of acid-producing rock. Acid-producing rocks occur in scattered areas throughout North Carolina. Similarly, acid-producing rocks can adversely affect the stability of slopes, particularly if untreated material is used in the construction of embankments. 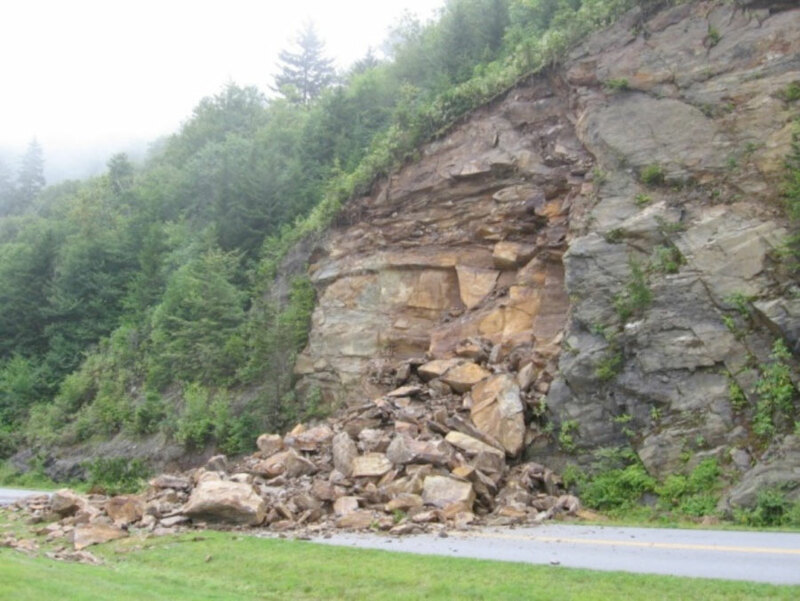 Acid-producing rock was a contributing factor in this 2006 rockslide on the Blue Ridge Parkway, as was the case in the slope failures of Swain County in 2003 and Haywood County in 2006, or the road cuts contributing to rockslides on the Blue Ridge Parkway in 1999 and 2006. To avoid similar damage, the presence of significant amounts of acid-producing rock was a consideration in evaluating alternatives for the North Shore Road extension in the Great Smoky Mountains National Park in Swain County. Given these many concerns, well-established, standard engineering practices have been developed to isolate or neutralize acid-producing rock when encountered in construction. Figure: Acid-producing rock was a contributing factor in this 2006 rockslide on the Blue Ridge Parkway.